Spring may be over, along with the riot of color that is so easy to achieve, but the summer also brings lots of color to our Bucks County gardens. Many plants thrive in the heat of summer, and provide color in what could otherwise be a dull, hot and humid time. We are always looking for deer-resistant plants, and Lavender is probably one of the few plants that is truly ‘deer-proof’. There are many cultivars to choose from, along with purple, pink or white flowers, short stature plants, and those that reach 3-4′ in height. Lavender ‘Hidcote’ and ‘Munstead’ are low-growing, common cultivars seen at local garden centers. Lavender ‘Provence’ is an outstanding, upright 2′ tall plant and takes to hedging quite well. For a tall, shrub-like Lavender, ‘Grappenhall’ makes a bold statement. 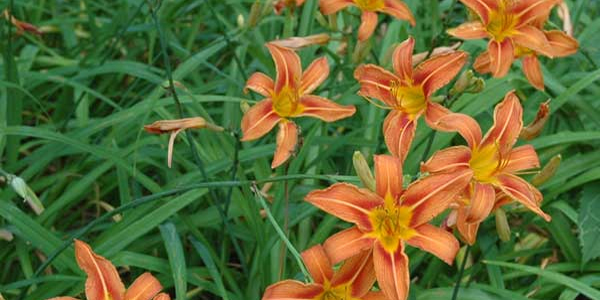 Daylilies are usually not on the list for deer-resistant plants, but Hemerocallis fulva (Common Orange Daylily) is another plant that deer won’t eat. This species of Daylily is considered an invasive plant in some states, including Pennsylvania. However, this plant is not nearly as aggressive as many of the unwanted invasives in our area such as Japanese stiltgrass, Lesser celandine, or Garlic mustard. The use of any plant labeled as ‘invasive’ must be weighed carefully against the intended use of the plant- but that is an issue for another time!